The Equicizer was the star of the show… the Harry Show that is! On Wednesday, May 10, 2017 Harry Connick Jr had a lesson from former jockey Rose Napravnik on no other than one of our Equicizer Classic's. The Kentucky Derby themed episode put our wooden horse in front of a national audience. Frankie and Kayla personally chauffeured the Equicizer out to the Big Apple for the episode. You can watch it on YouTube by clicking the image at right. Please feel free to share across social media with your friends and family! On May 21st, this beautiful double rainbow stretched over the Wooden Horse Corporation office and Equicizer workshop in Norwalk, Ohio. Wooden Horse Wednesday is our blog for all things Equicizer. We feature informational posts for Equicizer fans and owners to learn more about the latest news on our products and company, and much more! 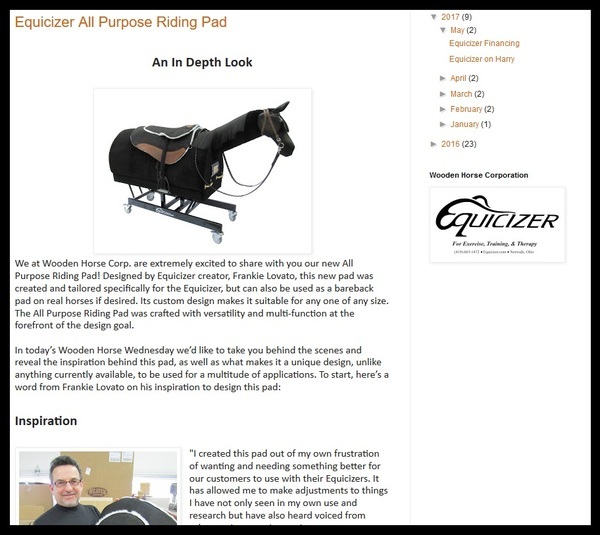 The last post featured our financing options and this week we will be sharing more information about our newest product – the Equcizer All Purpose Riding Pad. You can subscribe to our blog posts to get notifications when a new post is up. Just enter your email in the bar under the header and click submit! Below we have included a sneak peak of this week’s post… follow this link to read more: woodenhorsewednesday.blogspot.com. We are always looking for guest bloggers so if you have something to share about the Equicizer, feel free to contact us.